Using this option an existing project can be loaded, after loading the project becomes the currently open project. A list of all the projects is displayed, including the currently opened project. Selecting Cancel returns to the Project Options without loading a project. Selecting Load loads the highlighted project, after this the project just loaded becomes the project currently open. The project to load is highlighted and Load selected. 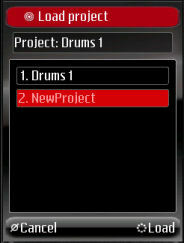 The project called "NewProject" is loaded, after loading the project, the Project Options screen is displayed.